There’s nothing quite like taking your Jeep for an awesome off-road trail running. But a cracked or broken windshield can bring a quick end to your festivities! I’ve got some great trails around me, but they are peppered with small rocks and trees that can easily take out my Jeep’s windshield (or a window) if I’m not careful. Is Your Jeep Windshield Already Cracked? I’ve never managed to completely shatter a Jeep windshield. I’ve even had whole tree branches punch through my windshield, and it didn’t manage to fully break it. But I did have to replace the glass in that case. I’ve seen people shatter their Jeep windshields, but in almost every case those windshields were already cracked. Yes, it’s exactly what you’re thinking — the cracked windshield weakens the structure of the glass and makes it easier for it to shatter. Now, it isn’t going to break like a wine glass in your kitchen. Automotive glass is made up of 2 layers of glass that is adhered to a plastic film between the layers — so it might shatter, but it won’t fall into your cabin or out onto your hood. 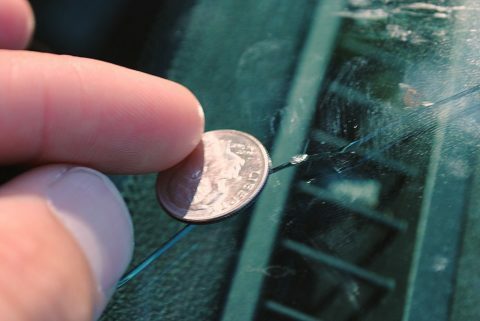 So, should you repair your cracked windshield or just replace it? When you repair the glass of a Jeep windshield, it should be done as soon as possible after the crack occurs. I know, no one likes to take the time to get their windshield repaired — but the longer you wait, the higher the chance that the crack will expand. Then you’ll end up having to replace it anyway. I’m guilty of leaving my cracks until they lead to a windshield replacement. If they’re not in my line of sight, I tend to ignore them. 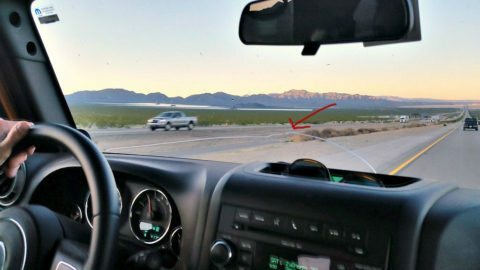 The problem is that these big, flat windshields are rock magnets — every pebble on the road makes a bee-line for the windshield! If you get the chance to repair your windshield, I suggest you do it or find someone who can repair it for you. It’s not hard or time-intensive, but letting it go until you need to replace your windshield can end up breaking the bank. Jeep Brand Or Aftermarket Jeep Windshield? Jeep brand windshields are expensive. For example, a windshield for a 2012 Jeep Wrangler might set you back $800. Should you insist on the costly OEM windshield, or will an aftermarket replacement work just as well? I’ll admit, I’m a bit of a brand junkie and tend to pick up OEM parts wherever possible. When you’re looking at an $800 windshield, though, I know that’s not always possible. Just make sure you’re aware of the quality of the windshield you’re purchasing. Aftermarket windshields will fit perfectly, but they might not be the same thickness as your OEM glass — and they might not end up being as durable. Replacing a Jeep windshield might look easy, but by making this a DIY project, you could end up making it a lot more expensive than a professional job. Aside from the possibility of breaking the windshield (which I have done with window glass, but not windshields), you’ve got no warranty if something goes wrong. Chances are, your insurance isn’t going to cover any part of it. Most comprehensive insurance policies will cover most or all of the cost of windshield damage. It might be cheaper if you don’t have comprehensive insurance, but if you end up buying multiple windshields because you break them while trying to install them — you’re not saving any money. Your Jeep windshield might be a pebble magnet, but it doesn’t have to be a money sink. If it cracks, get it fixed. And if it shatters, get it replaced. It’s as simple as that. Don’t wait too long to get it fixed though, or you might find yourself spending tons of money on a new Jeep windshield. I’m an automotive journalist, YouTuber, and blogger who babbles about Jeeps, RVs, and other vehicles on the Internet. In my free time, I enjoy hanging out with my wife and 2 sons, working on our home & lawn, and watching the Pittsburgh Penguins.